Male Run Tee helps to resist mechanical pull-out which is suitable for use with thin-wall tubing. 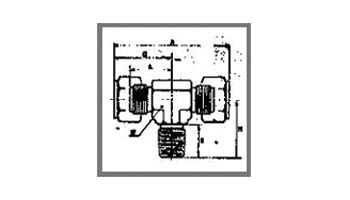 They are ideal for refrigeration equipment, air compressors, and machinery. 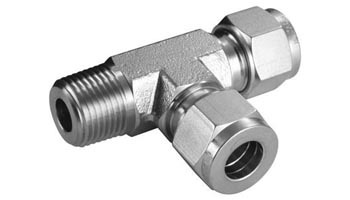 These ferrule fittings Manufactured using excellent quality material like Stainless Steel, SS 304, SS 316, Copper, Brass and other materials in compliance with international quality standards. We Naturals Steels are dedicatedly engaged in manufacturing and supplying a vast array of Mae Rune Tee Tube Fittings are most popular for its diverse industrial needs. We assure you the best products and services at leading market prices. Request a free quote today or send an enquiry to get the best tube fittings products that suitable for your application! Natural Steels is one of the top manufacturers and suppliers of Tube Fittings from India. Our prices for Male Run Tee are very reasonable. Please click on contact us now button or click here to send your requirement. Natural Steels maintains a high-inventory of Tube Fittings and can export them at the best price for Male Run Tee. Natural Steels is a leading manufacturer, supplier and exporter of Male Run Tee from India. We maintain a huge inventory of Tube Fittings and you can buy Male Run Tee at the best price. Please click on Contact us now button or click here to send us your complete requirement to Buy Male Run Tee from Natural Steels. Exporting Male Run Tee to Singapore, Malaysia, Hongkong, Thailand, Indonesia, Taiwan. Other countries includes Afghanistan, Albania, Andorra, Austria, Bahrain, Bangladesh, Bhutan, Brunei, Belarus, Belgium, Bulgaria, Cambodia, China, Cyprus, Croatia, Czech Republic, Denmark, Estonia, Egypt, Finland, France, Germany, Greece, Georgia, Hungary, Iceland, Ireland, Italy, Iran, Iraq, Israel, Japan, Jordan, Kazakhstan, Kuwait, Kyrgyzstan, Lebanon, Latvia, Latin America, Liechtenstein, Lithuania, Luxembourg, Malta, Moldova, Monaco, Maldives, Mongolia, Myanmar (Burma), Nepal, North Korea, Netherlands, Norway, Oman, Poland, Portugal, Pakistan, Palestine, Philippines, Qatar, Russia, Romania, Russia, San Marino, Serbia and Montenegro, Slovakia, Slovenia, Spain, Sweden, Switzerland, Saudi Arabia, South Korea, South Africa, Sri Lanka, Syria, Tanzania, Tajikistan, Thailand, Turkey, Turkmenistan, Ukraine, United Kingdom, United Arab Emirates (UAE), Uzbekistan, Vietnam, Yemen.